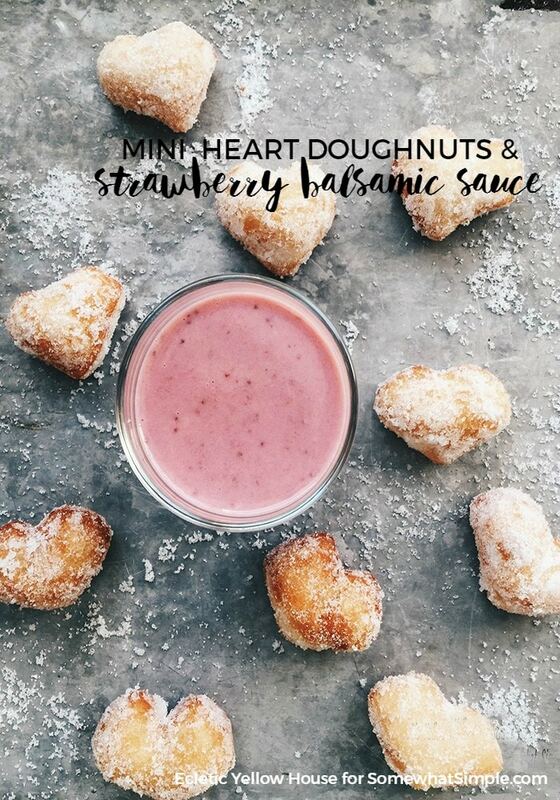 These easy mini heart doughnuts are really tasty on their own, but I’ve got a recipe for a Sweet Strawberry Balsamic dipping sauce that really sends them over the top! 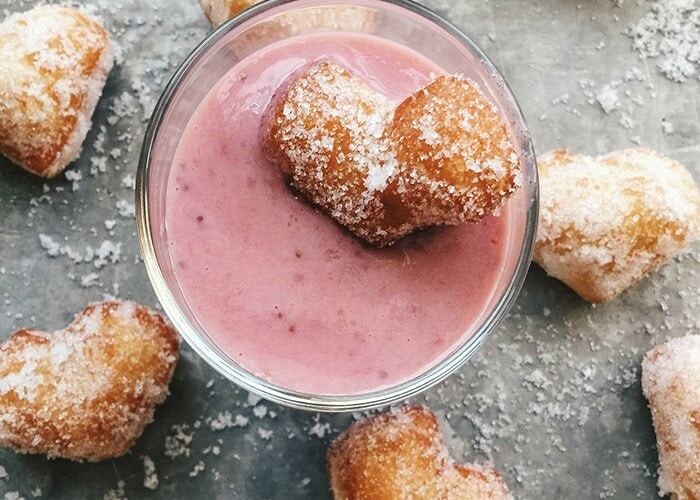 This recipe is something you need to add to your Valentine’s Day arsenal, but they can really be made anytime of the year. 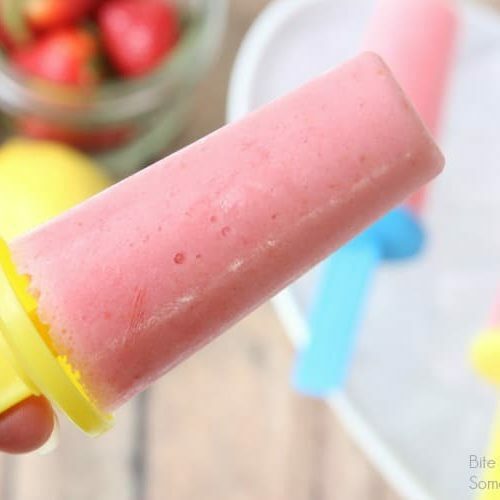 The sauce sounds fancy, but it’s not hard to make, and you just might want to keep some extra on hand for drizzling over ice cream or pound cake with berries. Place a small saucepan over medium heat. Add in the strawberries and white wine. 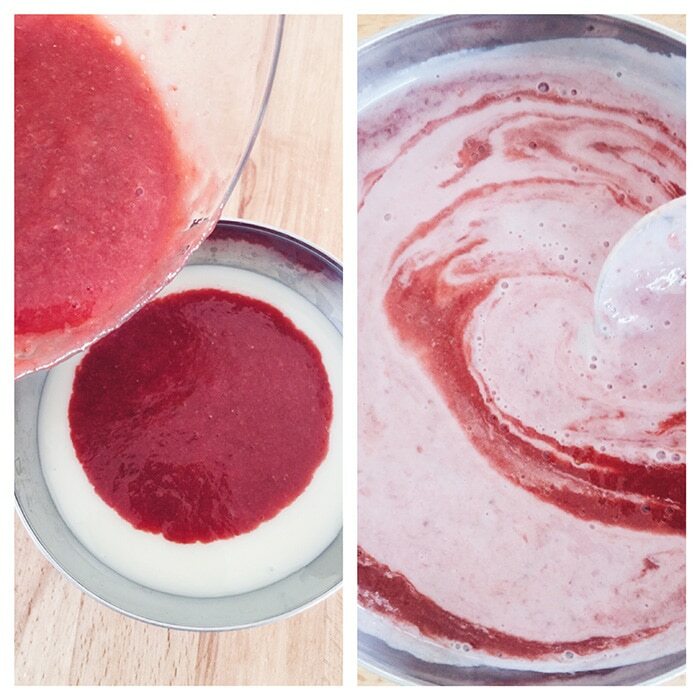 Simmer until the strawberries begin to break down, mashing with a fork or potato masher to help them. Cook until reduced and thickened, about 5 minutes. Take off the heat and add balsamic vinegar. Stir to combine, then swirl into sweetened condensed milk. Set aside. Heat about 2 inches of oil in a heavy pot over medium high heat until it reaches 350 degrees. 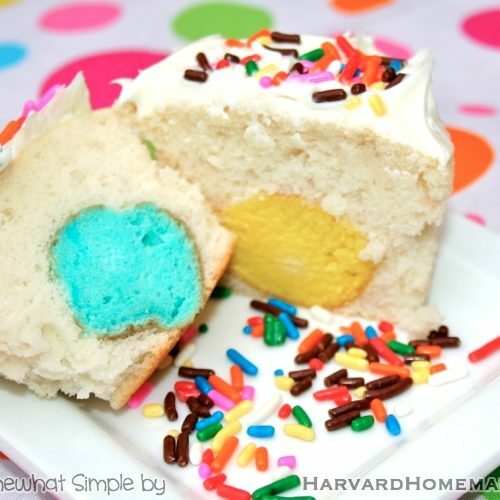 Place granulated sugar in a paper bag or a small bowl. Meanwhile, cut doughnuts into heart shapes. Start by flattening the dough circles a little, then cutting them into fourths. 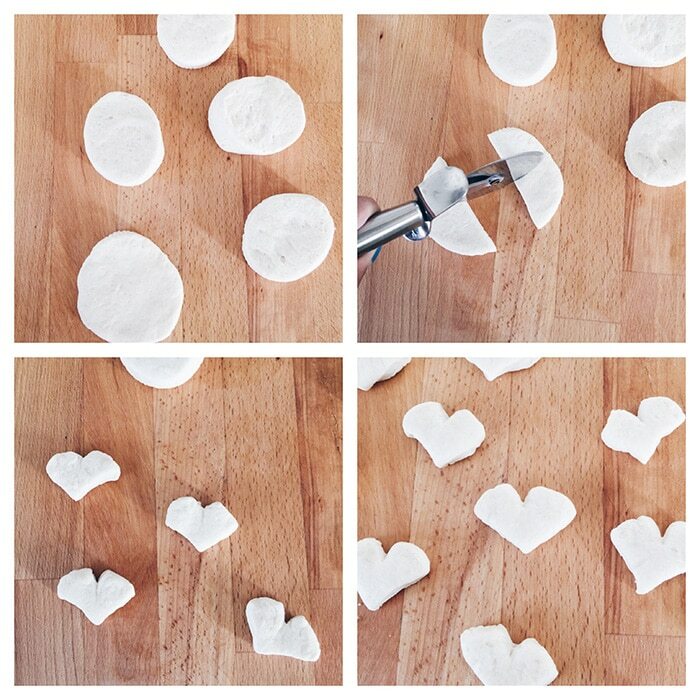 Cut a small slit into the rounded part of the dough and press cut edges into heart shape with fingers or the tip of a knife. 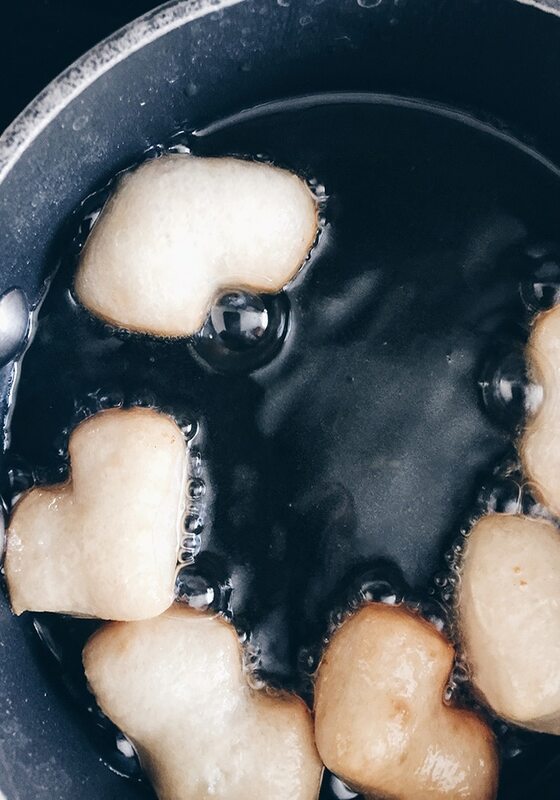 Drop into hot oil and fry for about a minute on each side, or until golden. Drain on paper towels and shake or roll in granulated sugar. 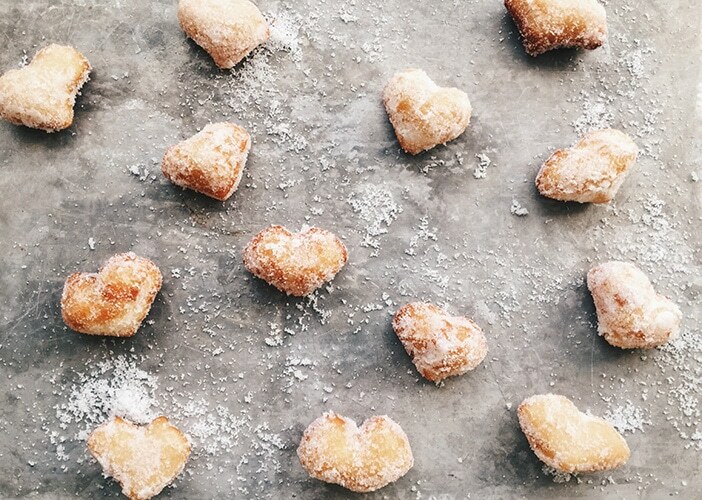 *Tip- Drop the little doughnuts into the oil by the bottom point of the heart to get an elongated heart shape.